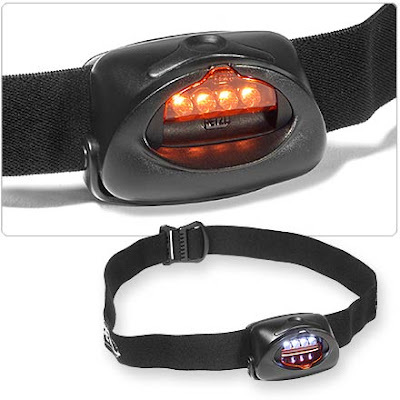 I always feel like a secret agent when I don my TacTikka Plus headlamp from Petzl. It’s the red flip filter that separates this LED powered lamp from other conventional torches. My wife originally gave me this headlamp so that I could hike, camp, and participate in other outdoor activities at night without drawing too much attention to myself. I quickly discovered, however, that the TacTikka Plus offers benefits to our hiking tour guests as well. If you have any hut stays along your tour that require bunk style accommodation then you’ll love the red “secret agent” filter built into this lamp. We always recommend a head lamp for hut stays, and this one is perfect for fumbling around during the middle of the night without disturbing your sleeping neighbors. Originally designed for hunting, fishing, and sailing, the red filter ensures discreet lighting when you need it most. Just alternate between white or red light simply by moving the pivoting filter over the LEDs . This lamp is super compact and lightweight so it’s also easy to throw into a daypack. Be careful though, it’s so small that you might lose it in an obscure coat pocket. Four LEDs instead of three: Making it 80% brighter than the old Tikka and offering more even lighting without blank spots in the beam. Compact size: Not much larger than the small batteries that power it; Tactikka weighs a mere 2.75 ounces. 3 brightness settings: Maximum, optimum, economy, and a blinking mode (for conserving battery power or for signaling the user’s location). Ergonomically designed, comfortable to wear elastic headband. Pivoting light housing: Beam can be aimed where needed. I’ve had my TacTikka for 5 months now and I’ve tested it while hiking, camping, snowboarding, cycling, and more. I’ve used it in rain, sleet, cold and snow, and it hasn’t failed me yet. Petzl upgraded the switch on this new TacTikka, and I like it much better than the old one. The entire unit also feels tighter and more durable. The blinking option has been great when I forget my normal bike blights, and the red filter allows me to read until the wee hours of the morning without waking my wife. Interestingly, the red light also feels easier on my eyes. My only concern is that I might accidentally break off the red filter while it’s in the down position, but this hasn’t happened yet. In all, I give the TacTikka Plus two thumbs up, even if for those that aren’t aspiring secret agents. Nice review. Just be careful with that red filter. Thank you. Yeah, the red light has been known to get people in trouble on occasion! You know I bet this would be perfect for cyclists – I ride to and from work and am always looking for ways to be more visible.